A View from the Bridge - Arthur Miller. 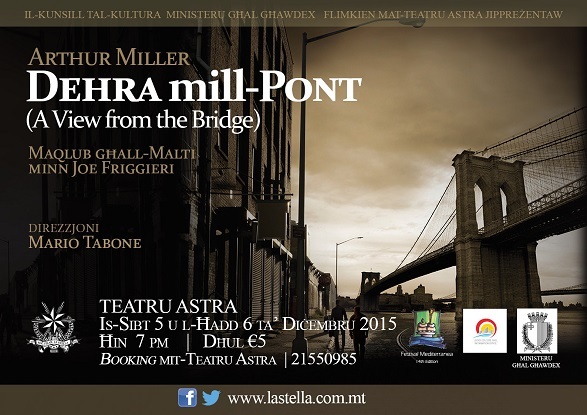 A Maltese version of the celebrated play View from the Bridge is set to be staged at Teatru Astra in early December as part of the annual Festival Mediterranea. The topicality of this work is obvious – the themes of illegal migration, poverty and sexuality dominate this Arthur Miller masterpiece and should resonate among local and foreign audiences alike. For this production George Camilleri doffs the clerical garb of last year's Doubt and puts on the coarse overalls of Brooklyn dock worker Eddie Carbone. Eddie's patriarchal control over his household is threatened by the clandestine arrival of his wife's (Maria Schembri) two Italian cousins (Oliver Farrugia and Jamie Camilleri) and the unexpected romance that develops between one of them and his wife’s orphaned niece Cathy (Sharona Refalo), whom Eddie has raised and dotes on. The tensions that arise bring about tragic consequences, a resolution predicted with impressive fatalism by the choric character of Alfieri (Michael Camilleri), the wise but helpless family lawyer. Translated by Joe Friggieri and directed by Mario Tabone, this production will be performed on Saturday 5th and Sunday 6th December at 7.30pm. Tickets at €5 from Teatru Astra, tel. 21550958.